The defendant had only passed his test 14 months before. A new driver smashed into the wall of a Nelson golf club just after it had undergone rebuilding work to the tune of £1,500, a court heard. Stephen Harrison's vehicle was found embedded in the wall at Marsden Park Golf Club at 8am. Harrison, who was not insured, had gone home. Burnley magistrates were told the club had had repeated problems with the wall being hit and it had only just been repaired. Harrison (23) who had only passed his test 14 months before and already had three points for speeding, has now got another five after the crash on April 13th. Mrs Alex Mann, prosecuting, said a breath test showed Harrison was just under the legal limit at the police station. She continued: "The defendant was saying he had some problems with the brakes and that's what caused the accident." Miss Cathryn Fell, defending, said Harrison had had the vehicle for about a week and thought he was insured, with the solicitor adding: "He went to pick his girlfriend up and on the way back it was raining very heavily. He took the bend wrongly. Maybe he was going too fast for the road at the time." 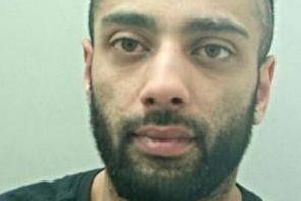 Miss Fell said the defendant had not been able to get a signal on his phone and went to his nearby home to sort out the recovery of the vehicle. He didn't make inquiries at the golf club and did not report the incident to the police. Harrison did not accept he was over the limit at the time of the accident. The solicitor added: "I think the accident and his behaviour were more due to age and naivety than anything else. He lost his job as a result of this incident." Harrison, of Fulham Street in Nelson, admitted failing to stop after an accident, failing to report an accident and no insurance. He was fined £80, with £85 costs and a £30 victim surcharge.